The Sir John Falstaff was built in the second half of the 17th Century. It takes its name from Shakespeare’s Henry 1V’s friend and partner in crime at Gads Hill. There is some evidence to suggest that the Doctors’ Surgery next door was the original hostelry. 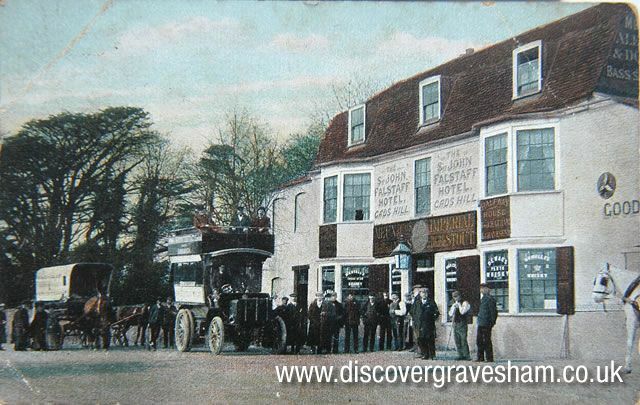 The Falstaff’s location on the old Dover Road, about half way between Gravesend and Rochester, brought it much trade from travellers and passing traffic. During the 19th Century regiments often passed on their way to Gravesend where they embarked for India. Ships’ companies (paid off, rowdy and tipsy) often made the inn and the area really dangerous. During that period, as with many village pubs, it became the mainstay of social life. The Parish Council held their vestry meetings at the inn and the guardians of the North Aylesford Union met there to discuss the poor of the area. Extracts from ‘A Mosaic History of Higham’ by Andrew Rootes and Ian Craig available from Gravesend Library.